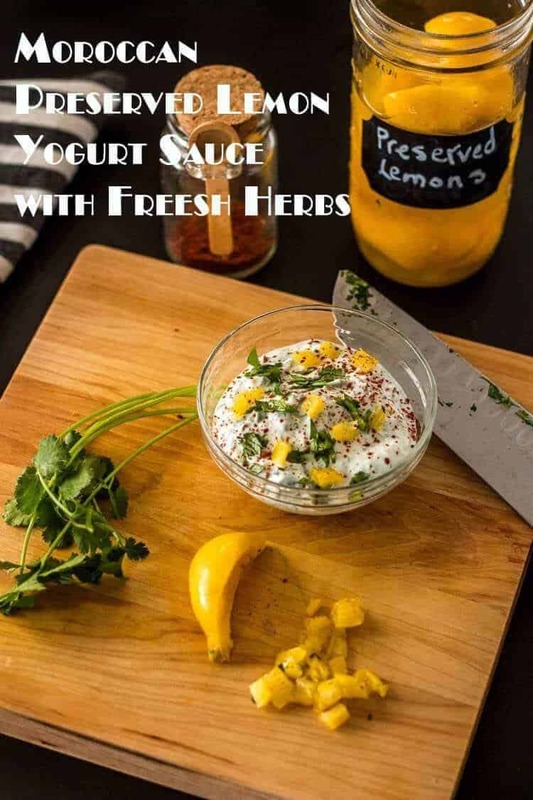 Tangy Greek yogurt gets a flavorful boost from preserved lemon and finely chopped fresh herbs… Easy Moroccan Preserved Lemon Yogurt Sauce with Fresh Herbs is a perfect finish to your Moroccan/Middle Eastern (even every day) dishes, and it’s so quick and easy to make! Why preserved lemons when fresh are so readily available and inexpensive? Fresh lemons are to preserved lemons as fresh tomatoes are to home canned tomatoes? No. Not at all. Boston chef Ana Sortun has a name for that: lemon umami. “Preserved lemons add a fermented quality that a regular lemon would not,” she says. 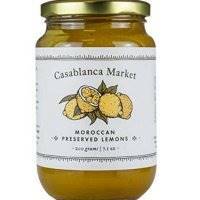 Preserved lemons are an indispensable ingredient in the Moroccan pantry. I first encountered them at a Moroccan restaurant where Mark and I celebrated our anniversary years ago. It was love at first bite! Originally lemons were preserved for the same reasons other foods are preserved – to extend their use past the growing season. They took on their own significance as a pantry item in North African cooking due to the intense and complex flavor they impart to a dish. Preserved lemons are widely available in the US now, but they’re not cheap. Why spend the money if you can make a big jar for a fraction of the cost? I live in south Texas (land of amazing and inexpensive citrus! ), but lemons are pretty darn affordable just about anywhere. 2 INGREDIENTS. You heard me right! And about 15 minutes of your time. The most difficult part of making a jar of preserved lemons is the anticipation. It may kill you. You need to shake the jar daily, but leave them alone for at least a month. Can you handle it? We just got into our first jar of these beauties about a week ago, and we’ve gone through half. 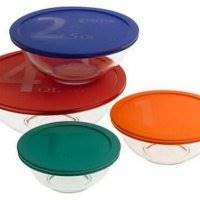 I’m planning on starting a second batch today so that I don’t have to do without. Dollop my Easy Moroccan Preserved Lemon Yogurt Sauce with Fresh Herbs on Moroccan Couscous with Chick Pea, Spinach, and Dried Fruit or my North African Pressure Cooker Lamb Shanks. Use in Preserved Lemon + Roasted Garlic Hummus. 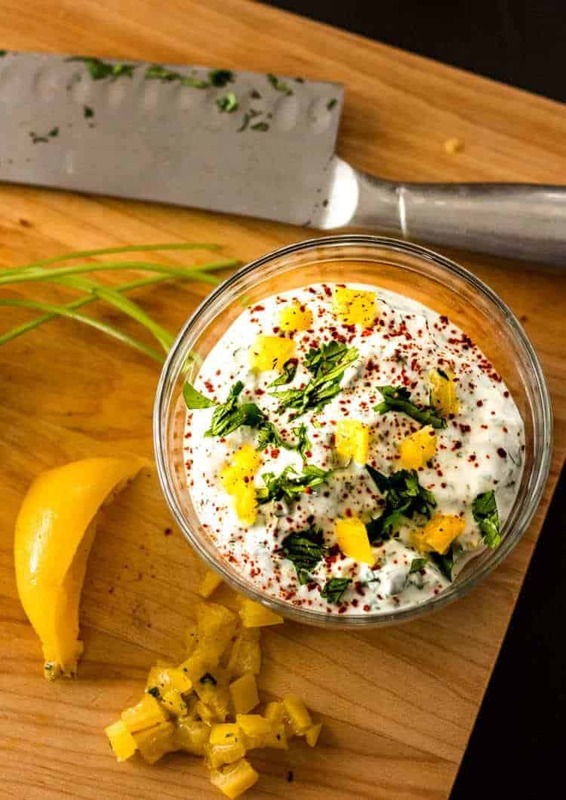 Try this Preserved Lemon & Mint Hummus. Use in Moroccan Spiced Nuts Trail Mix. Use on a simple roasted chicken. Use to brighten up a grain or potato salad. Just think of ways you use lemons to brighten up a dish, and sub in preserved lemons. IT REALLY IS THAT SIMPLE! 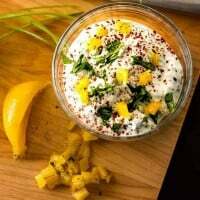 This yogurt sauce could not be more simple (or more delicious 😀 )! Whisk together 1 preserved lemon (minced), 1/4 cup of fresh herbs (cilantro, mint, orange mint, parsley – finely chopped), 1 to 2 teaspoons of liquid from the preserved lemons. Garnish with aleppo pepper (optional). Voilà! Tangy Greek yogurt gets a flavorful boost from preserved lemon and finely chopped fresh herbs... Easy Moroccan Preserved Lemon Yogurt Sauce with Fresh Herbs is a perfect finish to your Moroccan/Middle Eastern (even every day) dishes, and it's so quick and easy to make! 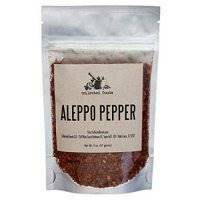 Garnish with aleppo pepper and/or additional minced lemon and herbs. Macronutrients (approximation from MyFitnessPal.com): 16 calories; 2 g protein; 2 g carbohydrates; 2 g fat. Note: Macros based on about an ounce of yogurt.